This Nov. 7, 2017 photo released by Madison Square Garden shows the dress rehearsal for the “Radio City Christmas Spectacular,” currently performing through Jan. 1 at Radio City Music Hall in New York. NEW YORK — One of the biggest draws in New York this time of year is the “Christmas Spectacular” featuring the iconic Rockettes at Radio City Music Hall. Everyone knows about their high kicks but do you know how many calories each burns? What do they snack on? What’s the best place to be in their famous kick line? Two veterans — Bailey Callahan of Melbourne, Florida, and Alissa LaVergne of Houston — reveal all the backstage secrets. Rockettes this year come from 27 states, plus Canada and Australia. New Jersey sent the most dancers, 12. Ohio is next with six. Pennsylvania, Florida and California each have five; Michigan, New York and Arizona, four each; Maryland, three; Georgia, North Carolina, Indiana, Connecticut, Texas, Nebraska and Virginia, two each. Louisiana, Rhode Island, Kentucky, Washington, Kansas, Wisconsin, Alabama, North Carolina, Utah, Illinois and New Hampshire, one each. Two come from Australia, five from Canada. 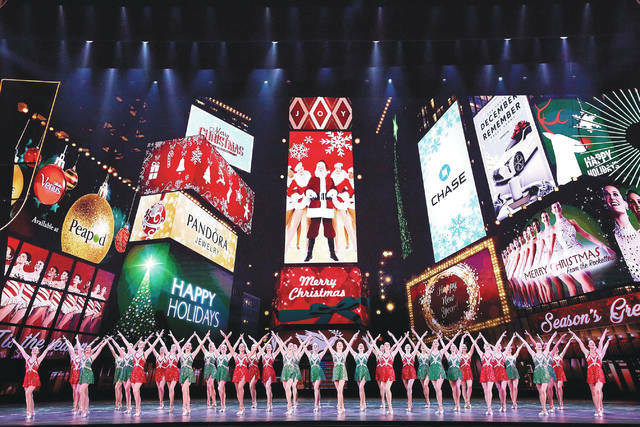 https://www.delgazette.com/wp-content/uploads/sites/40/2017/12/web1_DEL120217ROCKETTES.jpgThis Nov. 7, 2017 photo released by Madison Square Garden shows the dress rehearsal for the “Radio City Christmas Spectacular,” currently performing through Jan. 1 at Radio City Music Hall in New York. Mark Kennedy is at http://twitter.com/KennedyTwits.